Why should you do ITIL? ITIL provides a clear focus on the total cost of ownership (TCO), so you can reduce the, often costly, expenses associated with IT investments. The ITIL framework also gives guidance and structure to your organisation, minimising the likelihood of unscheduled work overtaking and de-railing current tasks and activities. Yet, its broad focus and flexible nature allows you to take on new tasks with ease. While still being based on proven best practices, ITIL 4 is more relevant to today's digital businesses. Its focus on the wider context of customer experience, value streams and digital transformation means it can help you to provide confidence and reassurance to your customers, while consistently delivering better services. The framework is also an effective change agent, and can be used to upskill, motivate and retain your workforce - helping to improve your overall business performance. What are the benefits to organisations? What are the benefits to individuals? Becoming ITIL-certified will make you a valuable resource. It will teach you to understand the language of ITIL - known by professionals worldwide - and will increase your standing in the IT community. ITIL is not about following a rigid set of rules, but instead, is about enabling you to use your common sense to give you an adaptable and flexible framework for managing IT services. Can you tell me some organisations that have already implemented ITIL? Several large organisations worldwide have implemented ITIL, such as Microsoft, Atos, Shell Oil, Caterpillar, IBM, Disney, Boeing, Spotify, Equinor, and many more. All reportedly enjoying great success, with significant operational cost savings as a result. When will ITIL 4 be available? The ITIL 4 modules will be released over the course of 2019, with Foundation available in February. The ITIL Specialist modules, ITIL Strategist and ITIL Leader will all be released in the second half of 2019. Full release dates for them will be out by the end of March. Details have not yet been given for ITIL Master. ITIL V3 continues to be recognised as a credible IT certification and the exam will remain available for some time, until AXELOS announces that the certification will be retired. This will also allow candidates enough time to collect the ITIL V3 credits that are a prerequisite to beginning ITIL Managing Professional. When are the ITIL 4 translations coming out? ITIL 4 will be translated into German, French, Japanese and Spanish in the first instance. More details of translations will be released by AXELOS in the first half of 2019. Can you explain the new certification levels? Note that the ITIL4 certification scheme now includes two different designation streams - ITIL Managing Professional (ITIL MP) and ITIL Strategic Leader (ITIL SL). Candidates can achieve a competitive advantage in the marketplace as both streams offer end-learners a clearer understanding of the specific areas in which they can improve their skillset, and provide the practical advice to do so. *Universal module for both ITIL designation streams. End-learners must complete the ITIL Managing Professional (ITIL MP) and ITIL Strategic Leader (ITIL SL) to be eligible to become an ITIL Master. More information on all of these qualifications and designations will be released in the second half of 2019. Do I have to redo ITIL Foundation? The ITIL 4 exam is widely different from the ITIL V3 Foundation, so AXELOS recommends completing the new course. However, if you hold 17 credits in the ITIL V3 scheme, then you are eligible to complete the ITIL Managing Professional transition module (once it is available) as an alternative to completing ITIL 4 Foundation. Where is ITIL Practitioner in ITIL 4? ITIL Practitioner will no longer be a stand-alone module, however the content covered in ITIL Practitioner will be integral to ITIL 4 modules. If I already hold ITIL V3 qualifications, what are my options? If you already possess 17 credits under the ITIL V3 qualification, then you are eligible to take the ITIL Managing Professional Transition Module - you do not have to take the ITIL V3 Managing Across the Lifecycle (MALC) exam. If you hold the ITIL Expert qualification, then you will also need to take the transition exam in order to convert your ITIL Expert designation to an ITIL Managing Professional. 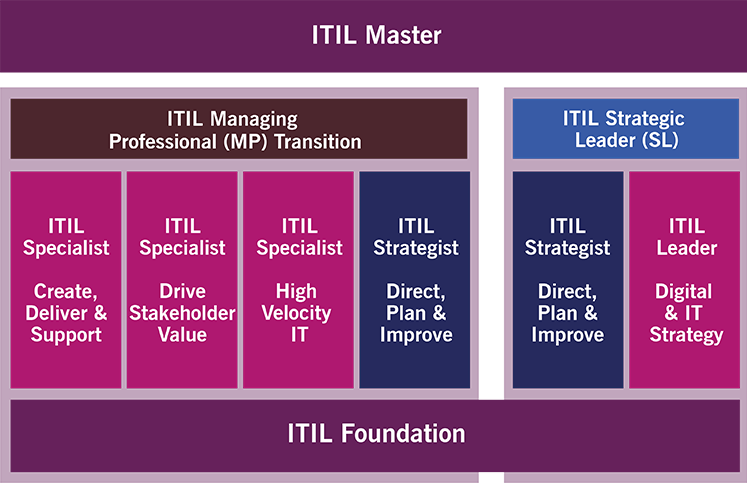 If you complete the ITIL Leader: Digital & IT Strategy, you then become an ITIL Strategic Leader.